posted August 18, 2017 04:45 AM bonus applied by Maurice on 18 Aug 2017. Edited by RoseKavalier at 15:57, 29 Jan 2019. 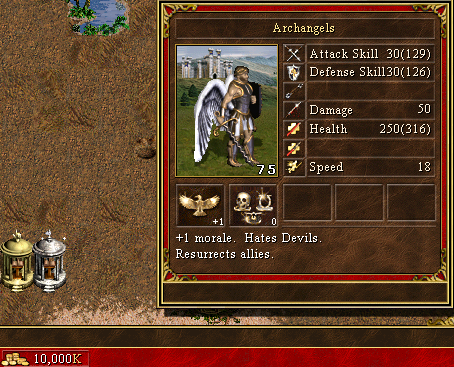 SoD_SP is a plugin for Heroes of Might and Magic III : Shadow of Death (SoD) which can be enabled with the HD mod. It is meant to be used in Single Player only, with most features completely disabled in Multiplayer modes. SoD_SP adds a number of features aimed at enhancing user experience (quality of life) while maintaining as much of the original gameplay mechanics. Some of these features already exist in some expansions or mods but were never incorporated to SoD while some features are completely new. You can decide which feature you would like to use or not by editing a simple text file. It has not been tested outside of SoD and no support will be given to other expansions/mods at this time. Early version previously posted here... much has since changed. If you are having difficulties using SoD_SP, try using this link. After experiencing a crash, please send me the debug and dump ini files. Please note that as of version 1.15 there is some minor debug information built in with regular versions. [+] Ability to disable "PLAGUE!" and "Month of the ..."
Some testing has been done... yet bugs may still survive. Use this thread to point them out. Edited by Maurice at 10:29, 18 Aug 2017. Rose, thanks for this! I will try it out as soon as I have the time. Just out of curiousity, what is the NWCZION bug you mean? Is it about the issue with shipyards for towns not near water? Edited by FfuzzyLogik at 10:41, 18 Aug 2017. I'm happy to be the first (Maurice beats me when I was typing) to write you some answer. Thanks for your work and nice interface to share ! I'll test it soon and give you feedbacks as asked ! The only thing I fear a bit (just reading) is autoupgrade, sometimes you prefer make slots of 1 creature and won't upgrade them (example for pixies to sprites) to use the slots of 1 to attract ennemies and take the counter attack. Very nice work even if I fear less persons play to "standard SoD" now and many want this kind of stuff working for their favourite mod. For now, make it work on SoD, then you can see for other mods what you'll do. Too hard to do things for all mods (at same time). I think you choice wise to make things "good" and be able to test. Does this work for Horn of the Abyss ? As such, it might ... but no guarantees whatsoever. The NWCZION bug is very similar to the 'Keymaster's Tent' bug* in that the flag is not reset at game creation (while the Cheater!! flag is). So you could go in a game, type in 'NWCZION'... start a new game and have your towns fully upgraded. Auto-upgrade still requires user input (hold and press 'A' then click on stack to upgrade) so you can upgrade exactly what you want. Basically it lets you skip the regular process of opening creature window, clicking upgrade and confirming. See second video for example. Some things might work, others definitely won't (possibly crash) or will be strange. Edited by Maurice at 15:50, 18 Aug 2017. Wait, what? You mean that if you visit a Keymaster tent and then start a new game (without actually exiting it), you are still flagged as having visited that particular Keymaster tent? Lol, never knew that . What happens if you load a game, does that clear the flags as it should? is the same issue with a wog game, when you use z vars 1-500, v vars 1-10000 ad flags 1-499, if you return to main menu and start another or same map, those values do not reset. 'Load Game' sets whatever values you had from your saved game whereas 'Restart Scenario' or 'New Game' don't reset the values. Is the new official Multiuplayer mode working with HD Mod? Edited by RoseKavalier at 20:01, 23 Oct 2017. This isn't the HDmod topic. New feature and bug fix, links updated. I also rewrote a lot of code, shouldn't change anything. EDIT: now requires CTRL to be held down to prevent mishaps. Tired of waiting for your next spell cast when you have 21 units? Waiting for Anti-Magic to wear off? Why not Zzzzzzz through it? Not really a new feature, but easy in-game customization has been added. Using the F12 hotkey while in Combat or on the Adventure Map, you can turn on/off any of the customizable SoD_SP options that are also present in 'SoD_SP.txt'. Note: the changes are not reflected in 'SoD_SP.txt', in order to avoid the need of continuously editing changes while in-game, just edit the options as you see fit in the textfile. [+] Option to reset Quick Spell target when setting up a new spell hotkey. [-] Fixed a bug with quick spells. [ ] Code optimization still ongoing. [ ] Introducing versions of the plugin. I don't like it because it makes Era useless. Joking, great job as always. is the mod also compatible with GOG Heroes 3 Complete? The moment you use HDmod, it should mostly work. What stretch filter/graphics mode are you using? I believe this may be the culprit since I never bothered to test that. Edited by RoseKavalier at 15:45, 05 Sep 2017. By gameplay modification - I mean something that is random like Plague! or such that you could technically avoid with RNG. The nearest thing to gameplay modification is the Turret Bug fix which is clearly a bug hence why I included it. Maybe I will change my mind in the future or with enough requests, but in the meantime I will post the required hex modifications in the how to edit HotA thread when I have them. "Numeric display of Morale, Luck and Spell duration (igrik)"
Ok but still only 3 spells display? That was a major flaw of vanilla. Totally agree, that's one of the many things I'm looking at but I can't seem to code fast enough lately now that I can make more stuff. I gotta do something wrong. The game very often crash. Most when I press F12, or if you want to cast spells in combat, or attack unit on the adventure map. The game crashes without warning. I have GOG version, Windows 10 and is installed on disk C:. If I remove the SoD_SP, then everything works perfectly.